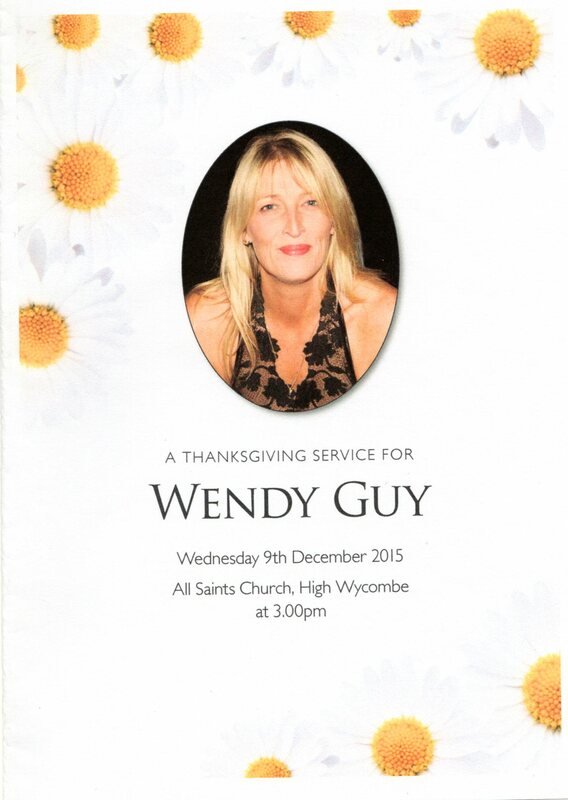 I would like to express my heartfelt thanks that so many people turned up to pay their final respects to Wendy. I feel bad that there were so many people that I never got to speak to everyone, it just became impossible. It was a difficult and emotional day, but in the end I felt that it was also a fitting one. The hymns and reading were chosen by Wendy herself, so she got to do it ‘her way.’ The tribute by Darren Topp on behalf of BHS was so appropriate. I know that we were all deeply moved by the tributes from Richard and Rebecca, and I so admired their courage in getting up to deliver them. I also want to thank our good friend Ian Morton for delivering the reading which meant so much to both of us. Wendy has excerpts from that reading as wall art about the house. Yesterday I received a call from Juliett, the funeral director. She told me that you had generously donated almost £1,000 to Wendy’s charities on the day alone. Thank you all so much for this. So many of you have let me know how much you all thought of Wendy. I too spoke on Wednesday, but I had to ‘tone down’ the emotion, or I would never have got through it. I often told Wendy how much I thought of her, but in her own self-deprocating way she would just say ‘you’re biased!’ But you have all shown me that she was indeed very special – it wasn’t just me. I was just the guy who was lucky enough to have her by my side every day, and I miss her terribly. Yesterday, together with Judy and Rebecca, we took Molly for a walk in Hughenden – something I had done with Wendy many times. We stopped at a bench to rest and there was single daisy growing in the grass, which seemed very poigniant. I didn’t pick it, but left it for others to enjoy. Today, I return to work. My employers have been very supportive, They let me work from home when Wendy needed me and they have given me the time and space I needed at the end. But I know I must pick up the pieces and carry on, I have to just take one day at a time. Some while ago, I signed up to the Decembeard campaign. Wendy hated the idea of me growing a beard, but reluctantly agreed that I should be allowed to do my bit for Beating Bowel Cancer. I couldn’t start on the 1st of December, because I wanted to be clean shaven for her on Wednesday. But I’m starting now and will continue into January to make up for the late start. You can sponsor me here. 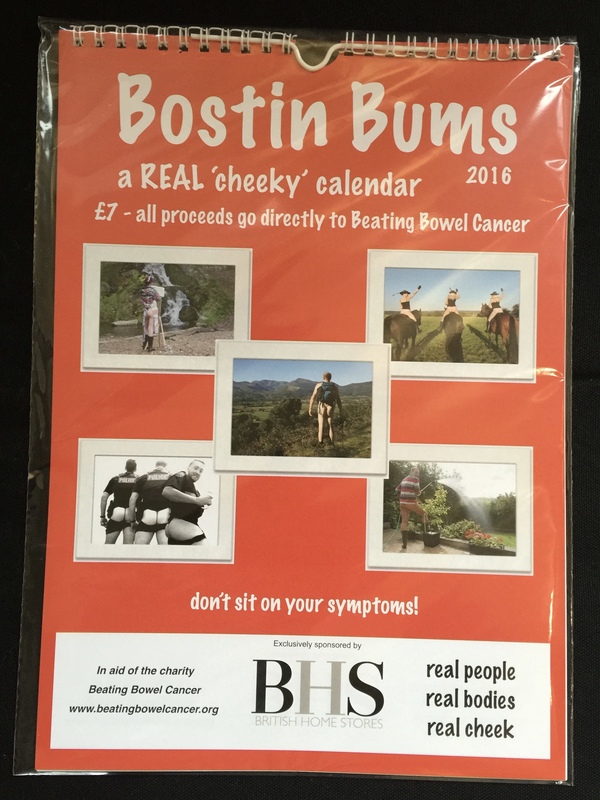 I still have a box of ‘Bostin Bums Calendars‘ to sell, please consider buying one if you haven’t already. We’ve lost our Wendy now, but sadly there are too many other people like her that need our help. Finally, can I say a big thank you to some of Wendy’s special friends who are still helping and supporting me. You know who you are and I really do appreciate it. Steve, it was an amazing celebration of Wendy’s life & you all done her so proud. It was an emotional roller coaster of a day so full of family & friends showing their love, respect & admiration of an amazing lady. Wendy will stay in my heart, they say we meet people & cross paths for a reason, I believe this to be true. My love to you all and my prayers to help you to get through the next stage of your lives which won’t be easy, the road ahead will be painful for a while but the sun will shine again and you will continue to gather daisies in Wendy’s honour, because she has taught us to embrace life & not take it for granted. It was an honour to be asked to do it so thank you. It was a beautiful service. Well done all of you Wendy would have been very proud. It was a lovely celebration of a wonderful life. Hi Steve, it was an honour to pay my last respect’s to Wendy. All of your tributes were beautiful and I thank you all for sharing them with us as I know it couldn’t have been easy. Wendy really was such an amazing inspirational lady and touched so many of us. She definitely made us all look at our lives in a different light. I will never look at the daisies growing on my lawn without thinking of Wendy. I will continue to help raise money and awareness in Wendy’s honour. Emotional day indeed Steve but all the tributes were perfect. Wendy may have left us but there will always be our wonderful memories each and every one of us made with her. You, Judith, Rebecca and Richard are without doubt often in my thoughts, all I can say is take it day by day some will be good, some will be bad, on bad days think of your wonderful happy memories you made together.